Image: Parkz/Dreamworld TVC (1986)/Dorney Park. Left to right: Eureka Mountain Mine Ride in 2015, Mine Ride in 1986, Dorney Park's 1950s Wild Mouse, the same ride system as Dreamworld's original Mine Ride. Eureka Mountain Mine Ride has been two completely different roller coasters in its history. The first lasted little over a year, operating from late-1986 until around 1989, while the second operated until 2006. 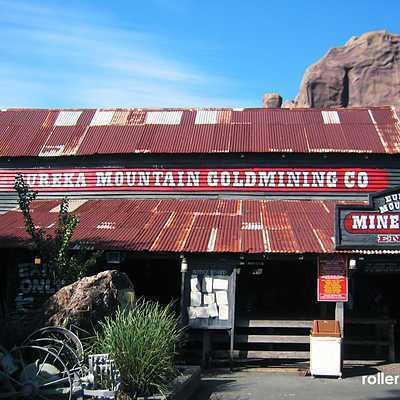 The original 1986 Eureka Mountain Mine Ride was a second hand Schiff-style wild mouse roller coaster likely built in the 1950s or early 60s in the USA or UK. It featured thin steel track and a wooden support structure. It was replaced in around 1989 by a new roller coaster built locally, featuring a somewhat different layout but utilising much of the original wooden support structure. Shortly after the 1989 version opened it was significantly modified by removing the last few turns and drops. The ride was closed in 2006 but it was not physically removed. In 2015 Dreamworld investigated resurrecting the ride. In late 2017 the ride's exterior was removed to inspect the ride structure. 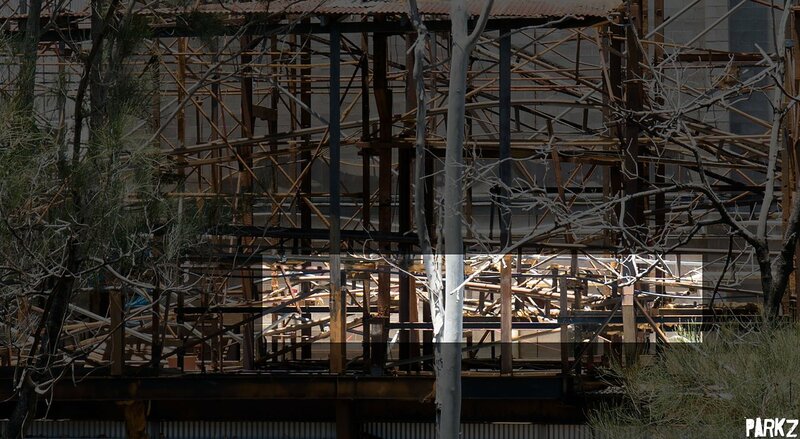 Soon after the ride was permanently demolished. The original ride was a wild mouse roller coaster either built by or licensed by USA ride manufacturer Ben Schiff, who operated as B.A. Schiff and Associates. They were based in Miami, Florida and were active from around 1947 to 1969. They built a number of wild mouse coasters identical to Eureka Mountain starting in the mid-1950s. A B.A. Schiff and Associates ad in a trade publication from the 1950s advertising the same ride system as Dreamworld's original Eureka Mountain Mine Ride. The company stopped building their wild mouse roller coasters around 1959 having sold the manufacturing technology for these rides to the Butlins chain of amusement parks in the UK. Butlins built a number of these rides around the UK in the 1960s. It's believed that Dreamworld sourced this original Mine Ride from an amusement operator in Perth for its 1986 debut. It is likely that it was imported to Perth as a second-hand ride, making Dreamworld its third owner at the very least. Eureka Mountain Mine Ride would have been nearly 30 years old if it were UK built or upwards of 40 years old if it came from the USA. 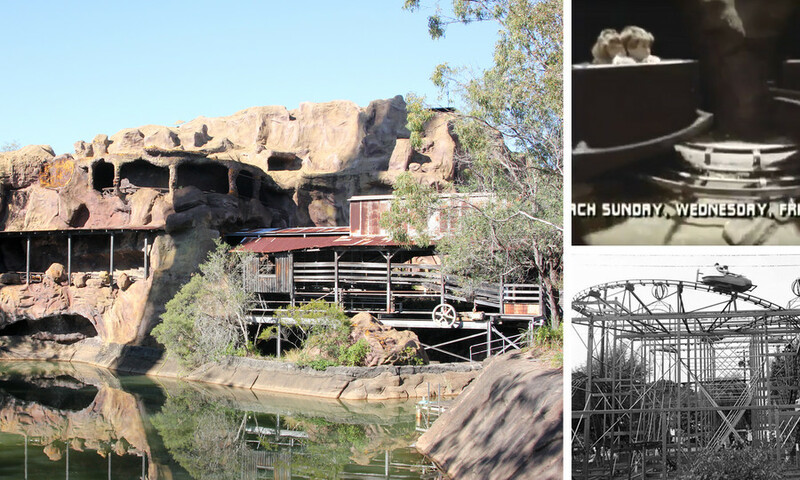 Eureka Mountain Mine Ride was vintage 1950s technology when it opened at Dreamworld in 1986. 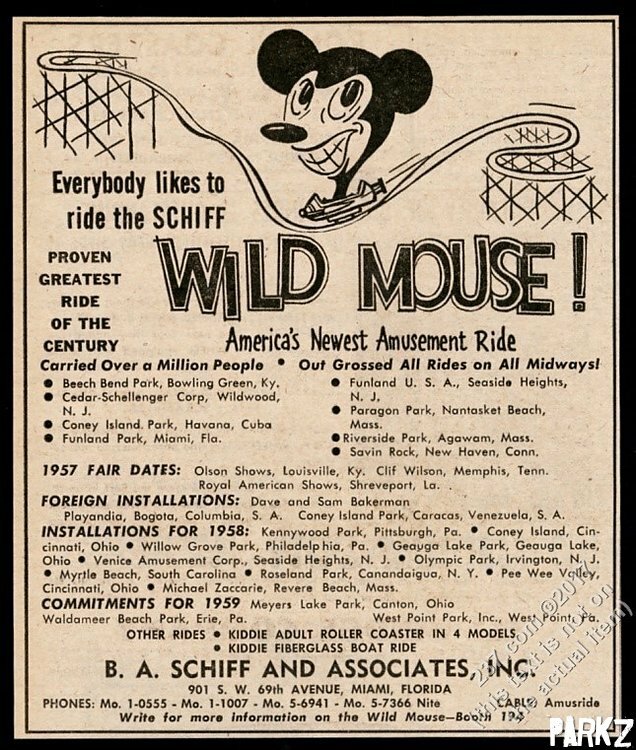 It was the larger version of Schiff's wild mouse, featuring a standard wild mouse course with a top level of hairpin turns before spiraling counter-clockwise down to a lower level of sharp turns and small dips. The brief shots of this ride from 0:07-0:15 show the unmistakable Schiff style of track. A small number of photos of this ride layout and track style exist; the RollerCoaster Database's pages for Wild Mouse at West Point Park and Wild Mouse at Dorney Park show this roller coaster style in detail. 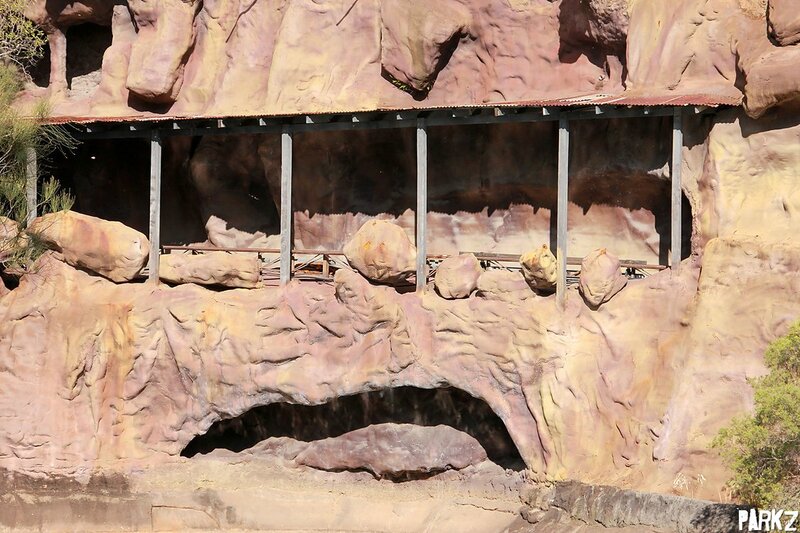 Much of the original structure was installed, but slight changes in places indicates that some of the original structure was rebuilt at Dreamworld. 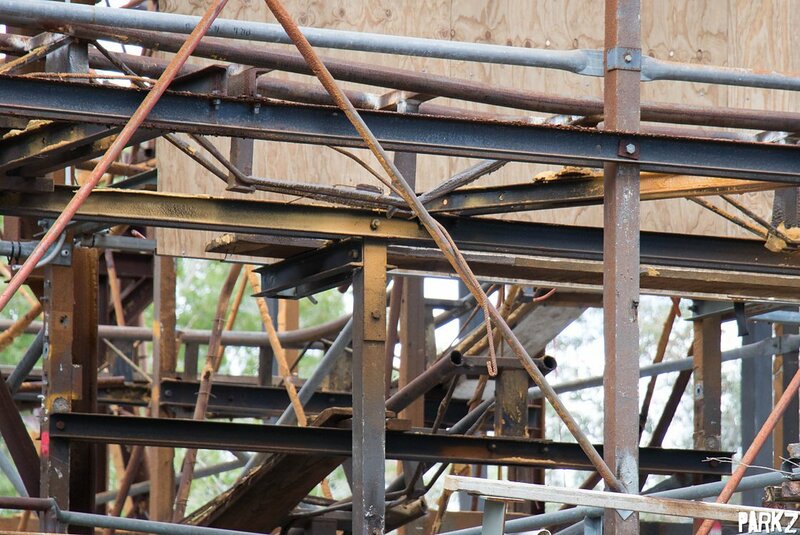 Some wooden beams are unpainted suggesting they replaced original beams that were painted grey when the ride operated outdoors. Some tubular steel support brackets on the original coaster were replaced by square steel of a significantly different design. 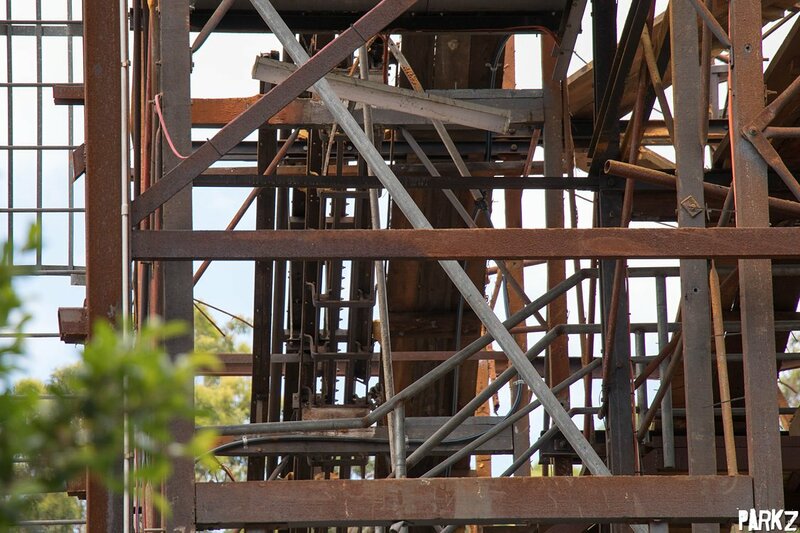 These occasional variations in the ride's structure indicate that it existed and operated long before, and that minor modifications or part replacements were made to get it operational at Dreamworld. Most noticeable to the casual observer, the decidedly 1950s mouse-inspired vehicles were modified to look like mine carts. Its simple steel track featured steel rails and a simple "mushroom bolt" upstop mechanism that allowed the vehicles to tilt outward on the sharp, fast turns. Riders sat two to a car in single file. The physical ride experience was more or less the same as the wooden wild mouse coasters found at Luna Park and formerly at Aussie World. It featured a combination of indoor and outdoor sections, with the mine cart themed vehicles darting in and out of the mountain structure throughout the course. It had barely settled in when Eureka Mountain Mine Ride was completely rebuilt. It's unclear what necessitated this shift. Whether it was the low capacity of the ride, inadequate safety systems or problems with components that were now upwards of 40 years old, Dreamworld set about completely replacing the ride system in 1989. HyFab, a local engineering firm was contracted to rebuild the ride. Details about this company are scant as they are no longer in business, though an Australian company with this name produced agricultural machinery. The new ride utilised much of the same ride support structure. Old track mounts – and even a few sections of the original track – remained in place on some of the supports, hidden for many years within the mountain, with new track installed on the existing timber structure. The new ride featured tubular steel track and more modern four-seat vehicles that were held rigidly on the track with a standard configuration of road wheels, guide wheels and upstop wheels. The original lift hill sat in place under the HyFab ride. The new roller coaster course wasn't identical despite using the same structure and following the same rough layout. Many of these differences appear to come down to a series of fabrication limitations and compromises to fit what they were capable of building onto the existing structure. Much of the new track is supported by the same original wooden structure, though some supports were added to accommodate the slightly changed layout. 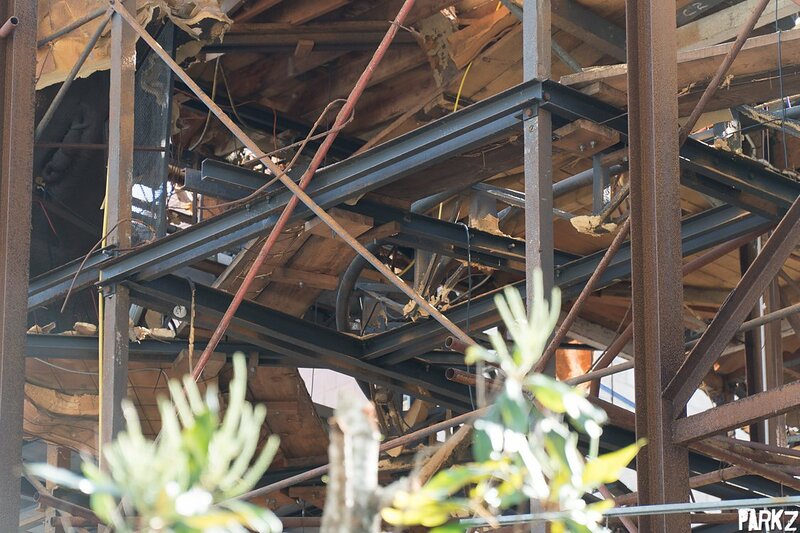 The ride's core structure retained much of that which appears on Schiff rides from the 1950s: wooden beams with x-shaped tubular steel cross-beams forming a lattice structure. So even with the update to 1980s technology the ride was still very much reliant on a support structure designed and built up to 40 years prior. The vertical wooden beams (painted light grey) with x-shaped tubular steel cross-beams are the original roller coaster's support structure. Steel beams (black) were bolted to this structure to support the new track in 1989. Instead of four hairpin turns at the start of the ride, the new version featured only two turns with a wider radius. At a glance, Mine Ride 2.0 features only one radius of turn on its entire course, suggesting that HyFab simply designed a technique for bending rails of one particular radius and reused it every time the track needed to turn. Mine Ride 2.0 also did away with the smooth, curved dips and hills of the original Schiff design and instead featured more abrupt transitions and straight drops. Again this was likely a fabrication limitation; instead of having to precisely bend a number of different drops to different specifications, HyFab simply bent the top and bottom of drops and placed straight track in between to get the required length and height. The result of this change was that Mine Ride 2.0 lost virtually all its moments of airtime, normally a key sensation on wild mouse coasters. The new version of the ride featured modern (for 1980s roller coasters) compressed air friction brakes instead of skid brakes and no doubt a number of other safety and operational improvements. The exterior mountain remained, though several changes were made to necessitate the revised track layout. New holes were cut where track now ran while old ones were patched. Holes such as this were patched and became very obvious in later years as the materials disintegrated at different rates. 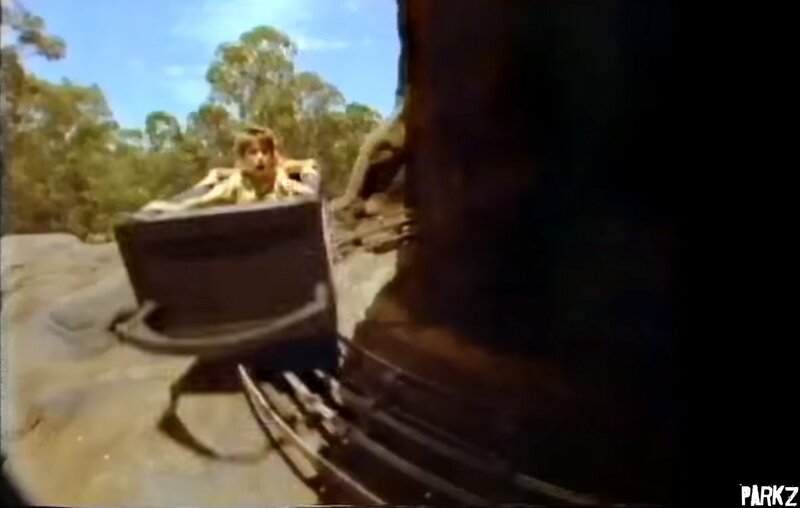 The newly rebuilt Mine Ride first appeared in Dreamworld's marketing materials and TV commercials in early 1989 and coincided with the installation of Skylink Chairlift, suggesting that the new ride was the brainchild of new owner Bruce Jenkins and his ill-fated Dreamco company. The best you can say about this second version of Eureka Mountain Mine Ride is that it was mildly fun. Like its predecessor it was certainly never a blockbuster thrill ride. But even as a family-friendly wild mouse roller coaster it was decidedly average and paled in comparison to the more balanced, enjoyable original attraction. Its first half was pleasant enough but without moments of airtime in its second half, the ride simply crescendoed with a series of abrupt, jarring maneuvers in the dark. The ride's final turns were so overly forceful that the smaller passenger was instructed to sit on the left to minimise how much they'd be crushed by their riding partner as they made their way through the counter-clockwise course that saw riders thrust heavily to the right for much of the ride. At some point early in its second incarnation the ride layout was modified; a series of turns immediately before the final brakes and unload platform were removed. In its place was a long, flat brake run that sat outside the original structure and warranted the construction of the familiar corrugated iron awning over the final stretch of track. This final brake run was a modification early in the life of the second Mine Ride, replacing a dark s-bend inside the mountain that was likely too fast and too violent after the ride was rebuilt with heavier, faster vehicles. 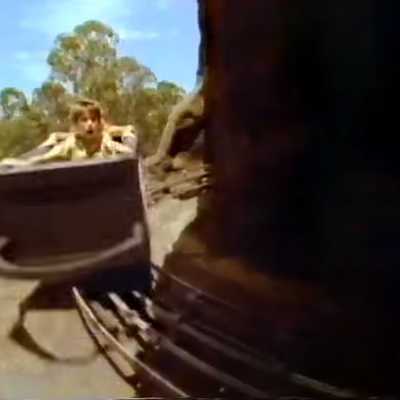 Shaky 8mm footage from early in the new Mine Ride's life shows a very different, abrupt end to the ride with the cars emerging from a pitch black left turn straight into the station. This is the HyFab equivalent of the sharp s-bend seen at the end of Dorney Park's Schiff wild mouse. No doubt an element that was far too intense so it was removed completely. The track running left to right at the top originally took a sharp turn to the left for a final dip in the pitch black mountain before a twist up to the station. The removed track didn't go far; it sat hidden within the mountain for decades. Track sections that were removed to accommodate the new brake run were simply placed atop other disused sections of track. This ride operated until November 2006 though this wasn't without significant changes along the way. Awnings were added to the previously exposed top hairpin turns and by the early 2000s the ride's only remaining exposed section of track – a dip before the turn over the station and queue. By 2003 this too was enclosed, making the roller coaster fully sheltered. In 2004 the ride's control system was replaced and its operating procedures simplified. The original unload platform was decommissioned and the ride spent its final few years with minimal staffing and poor capacity. After sitting dormant for nearly a decade, plans surfaced to resurrect the Eureka Mountain Mine Ride in 2015. In our November 2017 interview with CEO Craig Davidson we were told a few brief details about the project. Shortly after, the namesake mountain – equal parts iconic and decaying – was removed to allow Dreamworld and the engineers at Pitt and Sherry to closely inspect the ride's structure and assess its condition. We were told that if there was ten years left in the structure they'd be able to go ahead. In a few short weeks however these plans were scrapped and Dreamworld told Parkz that the project was not going ahead. Work commenced quite quickly on fully removing the ride. The ride was completely removed by December 2017. The plans were to re-enclose the ride and reopen the ride as a dark ride experience. New control systems and vehicles would bring the ride up to modern standards, though it's a little unclear how a ride with such violent transitions could ever utilise safe, modern restraints without injuring riders. Not to mention that custom engineered vehicles and control systems wouldn't come cheap given its unique track gauge and design. If Dreamworld were eager to reintroduce Eureka Mountain Mine Ride, the most logical, cost-effective and by far the safest solution would be to simply replace it with a modern, off-the-shelf wild mouse coaster (or a compact spinning coaster that doesn't draw unfavourable comparisons to Movie World's enclosed wild mouse, Scooby-Doo Spooky Coaster: Next Generation). 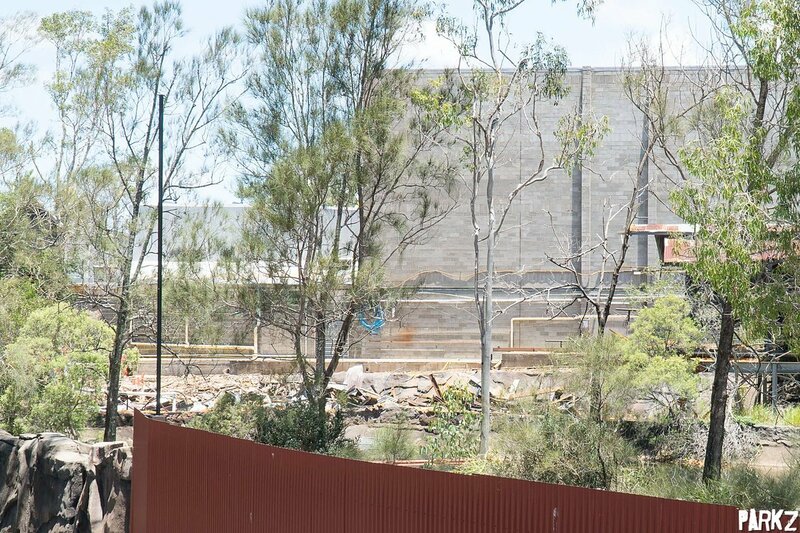 As it stands, Dreamworld have no plans for the expansive Gold Rush area.